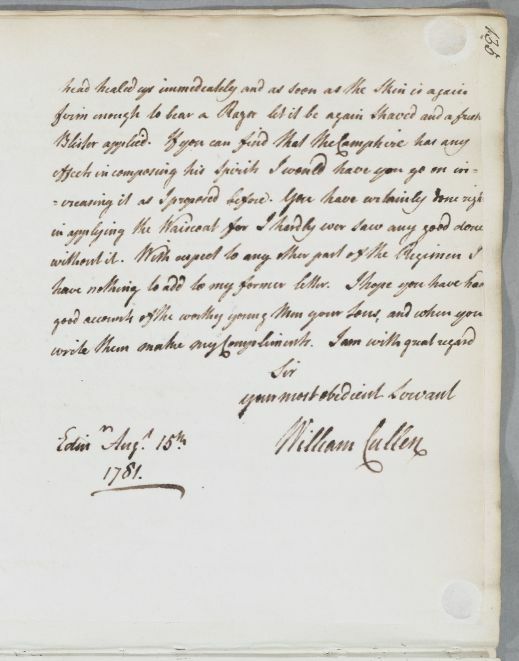 Letter to an unnamed physician [John McFarquhar or Fraquharson] enclosing directions for Mr Monro of Achannie who is suspected of having liver disease, and commenting on the reported case of Captain Ross who is mentally deranged (insane) and thought to be in need of restraint. The enclosure is Doc [ID:181] . 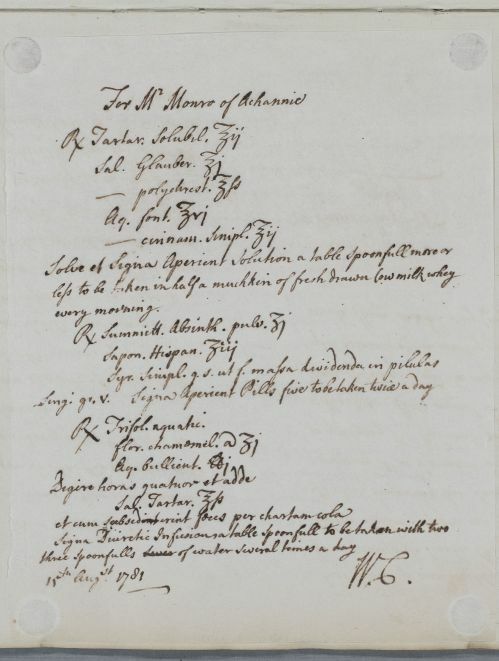 Summary Letter to an unnamed physician [John McFarquhar or Fraquharson] enclosing directions for Mr Monro of Achannie who is suspected of having liver disease, and commenting on the reported case of Captain Ross who is mentally deranged (insane) and thought to be in need of restraint. The enclosure is Doc [ID:181] . 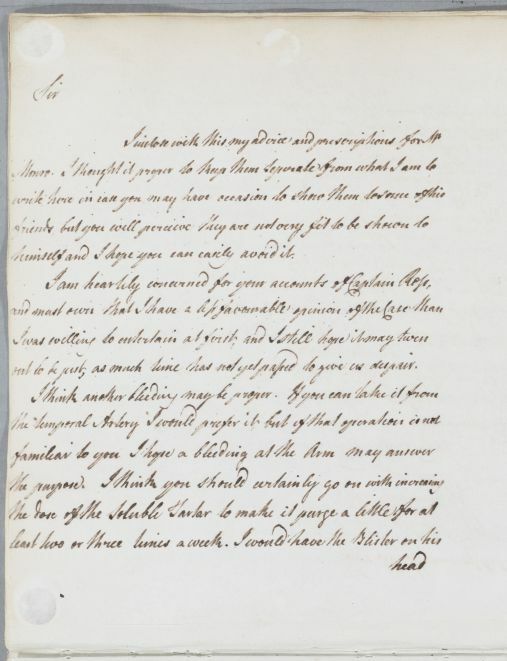 Case of Captain Ross, a young soldier, who caught a venereal infection when in America - which was treated - but who after recently attending a recent review at Ford George has started to display signs of a severe mental disorder. Case of Mr Hugh Munro of Achanie, who is suspected of having liver disease. himself and I hope you can easily avoid it. out to be just, as much time has not yet passed to give us despair. Take two ounces of soluble tartar, an ounce of Glauber's salts, half an ounce of polychrest salt, six ounces of spring water, two ounces of simple cinnamon water. Dissolve and Label: Aperient Solution, a tablespoonful more or less to be taken in half a muchkin of fresh drawn Cow milk whey every morning. Take a drachm each of water trefoil and camomile flowers, a pound of boiling water. Leave to set for four hours then add half an ounce of Tartar salts, and once the sediment has settled strain through paper. Label: Diuretic Infusion, a tablespoonful to be taken with two or three spoonfulls of water several times a day.